When Devinn Ashford ’16 moved back to campus this fall, she welcomed a roommate she never planned on having at Westminster: her sister Caela. For Caela, entering Westminster at freshman status this year, it is her second start to the college life. Above, Caela (left) and Devinn in their Westminster Grove townhouse. From the small town of Chillicothe, MO, Caela is the youngest and Devinn in the middle – two of three Ashford sisters, each only a year apart in age. After high school, they looked forward to attending different colleges and the opportunity for identities that weren’t always associated with their sisters. “It was a chance for a break – to each be our own person,” says Devinn. Last fall, Caela entered Truman State University in Kirksville, but fell ill less than two weeks into her first semester. Caela spent two weeks in ICU and nearly a month in the hospital. 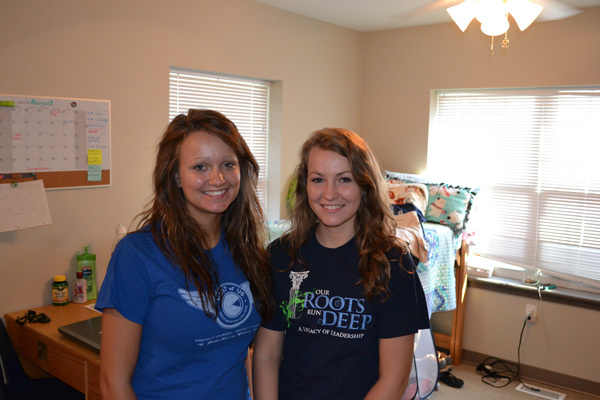 One year later, both young women have a newfound appreciation for college life and each other. Last August, as Devinn began her sophomore year at Westminster, Caela began her freshman year at Truman. After her first week of orientation, Caela went home for Labor Day weekend, but as soon as she returned to Truman, she didn’t feel well and began coughing up blood. Over the next couple of days, she quickly got worse. “I couldn’t go to class – I couldn’t get up and walk across the room,” says Caela. By the time her parents, Jeff and Lori Ashford, came to check on her on Thursday, they found Caela in her room, her lips blue from lack of oxygen. They drove her home to Chillicothe and straight to the emergency room. By the next day, Caela was in ICU in Liberty, MO. “I was healthy before this, except for occasional nosebleeds,” says Caela. Caela and her family found out those nosebleeds were signs of an autoimmune disorder, to which Caela is genetically pre-disposed. At the hospital, Caela was diagnosed with vasculitis, an inflammation of the blood vessels, although the root cause of her illness remains unknown. “The doctors had only seen a case like mine one other time before,” Caela says. Her lungs were bleeding, and the blood vessels in her kidneys had burst, leaving them functioning at 50 percent. By Sunday, Caela’s condition had worsened. She was intubated and sent via life-flight 18 miles to St. Luke’s Hospital in Kansas City. “They had never sent an 18 year old 18 miles by helicopter before,” Caela says, the fact indicative of the grave situation. With the help of Lily Suarez ’14, Devinn quickly made the trip from Fulton to Chillicothe, and her older sister Alisha flew in from San Diego. At the hospital, Devinn walked into a conference room with her family, while Caela lay in ICU. “I can’t do that” was the response they didn’t want to hear. At St. Luke’s, Caela was on full life support for nearly two weeks while the medical specialists and her family waited for her to pull through. She doesn’t remember anything from Sept. 5 until she woke up two weeks later. “There were tubes everywhere,” she says about first waking up. A long process of recovery began as she had to rebuild her muscle strength and learn to walk again. While the doctors have been unable to diagnose her condition fully, they treated her for microscopic polyangiitis and Wegener’s disease, an uncommon condition, rare for someone Caela’s age. Leaving the hospital on Sept. 30, Caela went home to continue treatment and recovery, working with five different specialists. Caela’s parents had withdrawn her from Truman State while she was in the hospital. Devinn spent nearly 3 weeks away from campus to be with her sister and family. When she left campus suddenly to travel to the hospital, Devinn says she was overwhelmed by the support she saw from Westminster. Students, faculty, and staff reached out, including the Wellness Center, her fellow Student Foundation members, and Director of Financial Aid Aimee Bristow, also from Chillicothe. Dr. Cinnamon Brown, her advisor, helped her navigate missing so many days. “The faculty told me not to worry – we’d figure it out when I got back,” Devinn says about the missed class time. When she returned to Westminster, Devinn had one week to catch up before four exams. Her professors changed the exam schedule so they were one at a time and more manageable for her. A pre-med major, Devinn says the experience of Caela’s illness reinforced her decision to major in bio/chem. The illness changed perspectives for both sisters. Returning to Westminster, Devinn knew she wanted Caela to come with her. “Now we get along better – we understand each other better,” Devinn says. The support system and personal connections at Westminster were a strong draw for Caela. Chaz Baker in the Enrollment Services office helped to arrange phone interviews for Caela, still recovering, to compete for scholarships. Caela visited Westminster and sat in on classes before making the final decision to enroll. The sisters applied for special permission to live together in Westminster Grove, townhouses normally reserved for upperclassmen. The living arrangement helps Caela stay healthy by limiting her exposure to germs by living with her sister. Caela and Devinn are looking forward to spending the new school year together at Westminster. Caela has the same seminar advisor – Dr. Brown – that Devinn did, and her seminar mentor, Kate Sanchez, was Devinn’s freshman roommate. Despite the connections and similarities, Caela says she doesn’t feel like she will only be known as Devinn’s little sister at Westminster. Caela will continue seeing her doctors every three to five months throughout the school year, but says they keep seeing her improve.